How would you move your neck to depict the movement of a snake? A kiss on both cheeks? The concept of friendship? This app presents the neck movements (Greva Bhedha) used in the ancient, vibrant, and phenomenally popular Indian Classical dance form Bharatanatyam, in a simple and interactive format that you can always keep literally at your fingertips. The app features beautiful pictures of each neck movement, in an intuitive and swipable flash card format. 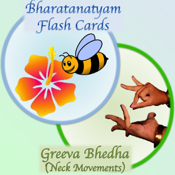 Click on a movement flashcard to flip it over and see its uses as prescribed in the ancient text, the Abhinaya Darpana. Click on the name of the movement to hear its pronunciation. Perhaps you are a student of Bharatanatyam, or a student of a different dance form wanting to know more about Bharatanatyam. Or perhaps you are the parent of a budding dancer. Maybe you are looking for a tool to spark your child’s interest. Or a teacher looking for an innovative teaching aid for your dance students. Perhaps you are a layperson, wanting to appreciate the nuances. Perhaps your granddaughter or niece or neighbor’s child has a big performance coming up and you want to better understand her recital. Or maybe you are an accomplished dancer, looking for a reference tool that you can dip into as needed. This app is tailored to be of use to anyone who is interested in learning or refreshing their knowledge of the basics of Bharatanatyam. It is part of a series of apps that lay out the entire Bharatanatyam vocabulary in a simple, intuitive, and interactive format that will appeal to beginners and experienced dancers, laypeople, teachers, experts, and dance enthusiasts. With an attractive user interface and content collated by a dancer and Bharatanatyam guru, this app brings you content straight from the ancient texts, in a format that caters to the modern day student.